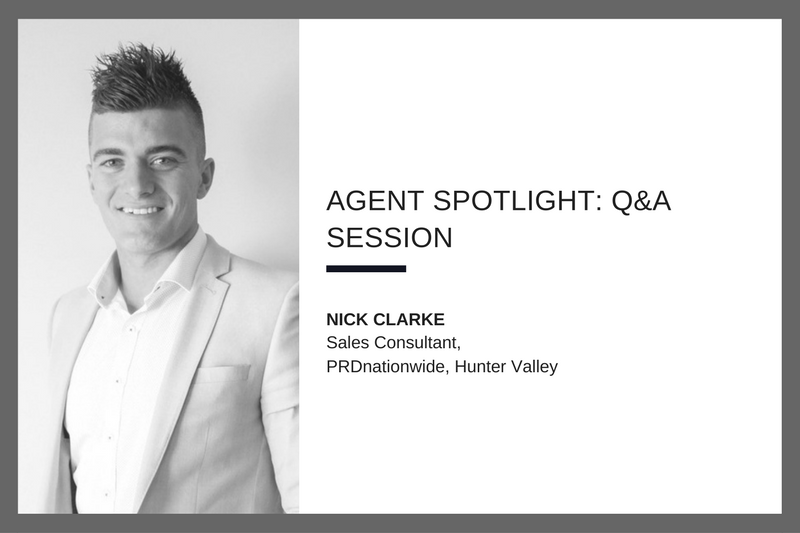 This month, we had a chance to sit down with Nick Clarke of PRDnationwide Hunter Valley, to learn more about what it is like to be one of the top agents in Australia. In the interview, Nick shares his experience as a millennial agent and his advice for the first home buyers. Nick: It was more by luck, I was trying to get a job in the mines because that was the main breadwinner in the area. I attended a real estate conference about buying investments and also work in real estate that PRD had on the show. I was only a young fellow, and then Luke Anderson encouraged me to apply for a role and said “come work for us.” I didn’t have another job so I thought I might as well do it and look where I’m at now. It was my calling. PRDnationwide: What led you to PRDnationwide in particular? Nick: When I applied for the job I had no idea, a few people told me PRDnationwide was the leading real estate company in Australia. I was very green to it all. However, working for PRD has obviously been a great opportunity. PRDnationwide is all about the community, they are all about the offices as well, and they believe in supporting their agents and supporting the community they live in. PRDnationwide: How has PRDnationwide supported you during the early years of your career? Nick: I have been with PRD about eight years now. When I was coming through the ranks, the conferences were a good source of learning. We were having one every quarter, it was really good training, and there was a lot of good quality content. PRDnationwide: Today you are one of the top agents in Australia, but obviously you did not start at the top. Was there a breakthrough point for you? Nick: There wasn't really a breakthrough point as such, I'm still breaking through at the moment, still early days. When I first started, I was working 70 hours a week. You're working all this overtime when you know you're not getting paid for it but you need to have that mindset that eventually it will be worth it. And that has definitely happened for me. You've got to put in the hard yards, earn nothing, and then it will pay off down the track. Nick: So the piece of advice for first-time home buyers is getting organised before coming to inspection. Understand what you can afford, get the budget in place, speak with the bank and get a pre-approval. As the good houses don’t last long in the market, you don’t have time to go and find the house that you are after and then figure out the finances. So as soon as you find the house that you want, you have got to jump on it pretty quickly. Otherwise, you will miss out. Nick: It just comes down to what you want. If you want to have a life, enjoy weekends, time with the kids in the afternoon, then fantastic, just be happy with earning an average salary and doing okay numbers. If you want to get to the top elite level, earn good money, you want to sell many homes, and you have got to make sacrifices in your life. I did not have a holiday for the first two years in real estate, so the first two years out by myself selling, not even a week off during the year, so, you have got to commit yourself to it. It takes its strain on your relationship and your lifestyle. However, I guess those were the sacrifices that I was prepared to ensure I would get to where I am today, and that is how I got there so quickly, by making other sacrifices in life. If you are not prepared to do that, then it is going to be very, very hard for you to try and reach the top. Also, time management is equally crucial, when I get to the office, I am there to work. I spend my whole day working, and then there's a little tiny break. I am eating lunch while I am working, so it is all about time management and making sure that you are on top of things. Nick: I worked under Luke for years when I first started in real estate, and that start obviously gave me a lot of the skills I have today. We are very close at PRDnationwide, sort of like family. I have the utmost respect for Luke. He’s a top bloke and an awesome fellow to work for.